Cooking sinigang (sour stew) is not new to me. Not a month will pass that I won't cook sinigang even for once. 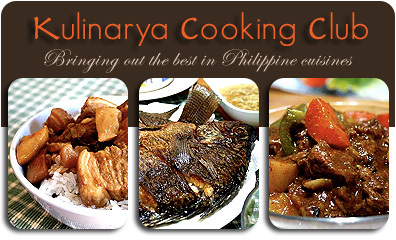 So when this sinigang challenge from KCC (Kulinarya Cooking Club) came, I was excited. Excited to do something different from my usual tamarind pork stew and I promised myself that I will prepare and cook this sinigang the old fashion way. No instant mixes this time. I researched and even asked our local vegetable vendor what's their local province's version of sinigang. Excited to try the Nueva Ecija's version of Chicken Sinigang, I asked her if she can find me a tamarind fruit. Unfortunately, it's out of season and she can't find any even at the largest vegetable distributor in Manila which is Balintawak. Kind of disappointed, I turned to my mom and asked for the family recipe of sinigang sa santol. She was even sad to know that I did not ask her first hand. Oh well, mothers :) I love my mom, she is a my savior for this challenge. 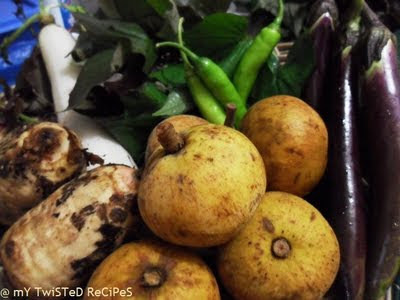 Since Manang Charlie (our local vegetable vendor) can't give me tamarind fruit, I just asked for her to buy me unripe santol (wild mangosteen). Manang is so kind. The next day, together with the star of the dish (santol) and the rest of what I needed, I went to the kitchen and challenged myself. In a large casserole, combine pork, salt and water. Bring to boil. Using a peeler, peel santol and cut into wedges. Careful not to cut through the seeds, If so, remove it. Once the pork boils, add in the santol wedges. 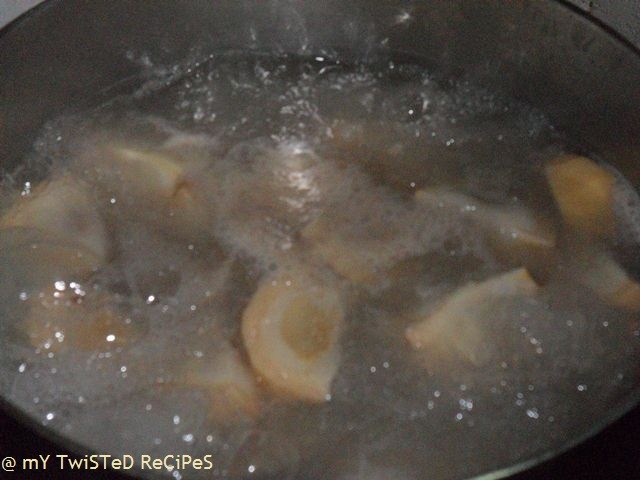 In a separate casserole, boil some water to cook your vegetables. Tenderize taro first. Once done (test with fork), remove from casserole and transfer to the boiling pork. Do this also with your radish. Blanch eggplant and set aside. Why did I cook the vegetable separately? According to my mom, if I combine the pork and santol, with the raw taro and radish, it will not tenderize. The acid from the santol will prevent this from happening. She did mention though that I can cook the santol separately. But since I want the sourness or flavor of the santol to penerate the pork, I chose to cook the vegetable separately. After 40 minutes, remove the santol wedges. 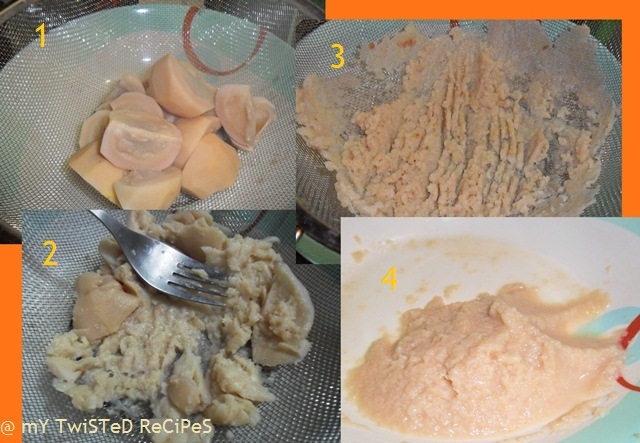 Discard the seeds and using a strainer, mash the santol wedges to produce a paste. Return the paste to the boiling pork. Season with fish sauce and add the green chili fingers. Simmer for another 30 minutes or until the meat can easily be separated from the bone. Add blanched eggplant and sweet potato sprouts. Cover and turn off flame. Please drop by Kulinarya Cooking Club to see other member's version of this Filipino dish. The last time I've had Sinigang sa Santol was when I was a kid and it was my grandma's dish. Although I can't remember the flavor but my memory of her making it is still there. Thank you for your wonderful dish which took me back to that day. I love santol in any form...and sinigang is one of them! Great entry dudut! Looks delicious! 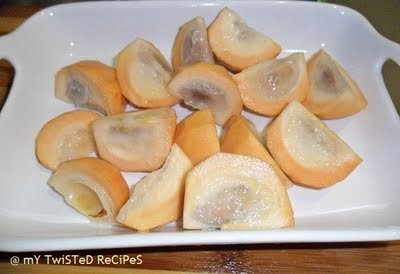 I wonder if santol is available in NYC? In any case, bravo! I haven't seen nor eaten santol in decades. It must be so nice in sinigang. Lovely! 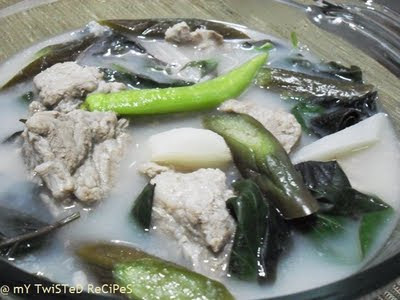 I love santol and this is the first time I've come across sinigang sa santol, thanks for sharing the recipe--I'm definitely going to try this next time. 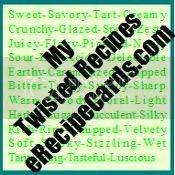 Thank you for visiting my blog and taking time to post a comment...I'm humbly honored to hear from you!